Posture is how you position yourself. In the car, at the desk, standing in the grocery line, and walking; the way you position your body throughout the day not only has a dramatic effect on you in the present moment (drowsiness, tension, and sore muscles) but it also will affect your long-term health. 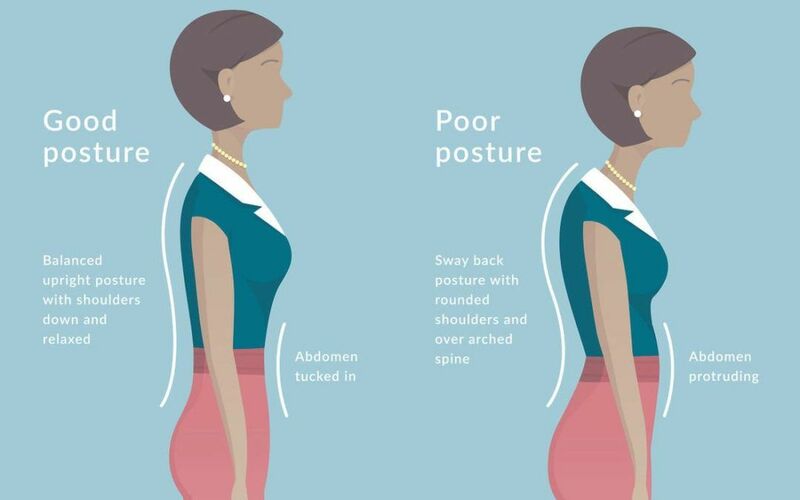 We all know that ‘bad posture’ means slouching in the chair, crossing the legs for extended periods of time, rounding the back, jutting the chin and head forward while working on the computer (and the list goes on). The bottom line is that years of poor posture can create a plethora of health problems. Did you know in any 3-month period, about 1 in 4 adults in the U.S. has at least 1 day of back pain? 1. Be mindful of your posture during everyday activities, like driving to work, sitting at the desk, standing at the sink, walking, sitting at the table, and sitting on the couch. 2. Take frequent breaks for stretching and moving your body in different ways. Try a few of these: stand up and lift one arm up and overhead to side-bend, roll the shoulders up to the ears and then back and down a few times, do controlled neck rolls, and round and flex the back while sitting. 3. Stay active by challenging yourself to get up and off your chair at least every hour. 5. Make sure work surfaces are at a comfortable height for you, whether you’re working in an office, doing a hobby, preparing dinner, or eating a meal. 6. Wear comfortable, supportive, and low-heeled shoes.